We designed the Omega Brushless Fuel Pump System to solve the fueling problems most GT-R owners have been plagued with for years. With over 2 years of extensive research and testing, we now have the ultimate fueling solution for your R35 GT-R! Because of the complexity of this system a USB thumb drive is included with detailed installation instructions. 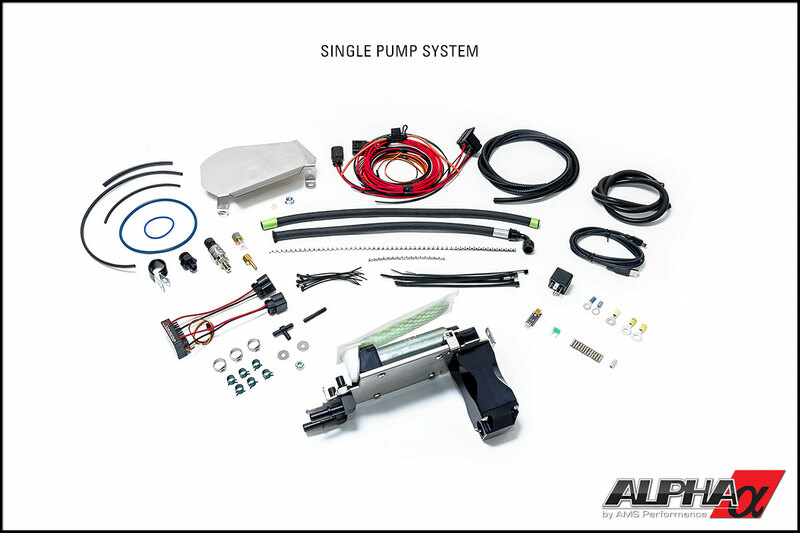 We designed the Omega Brushless Fuel Pump System to solve the fueling problems most GT-R owners have been plagued with for years. The fuel pump options for the GT-R were always a compromise – leaving us with a bulky, difficult to install, obnoxiously loud, multiple pump setups prone to fuel starvation. This is primarily due to pressure loss caused from overheating. 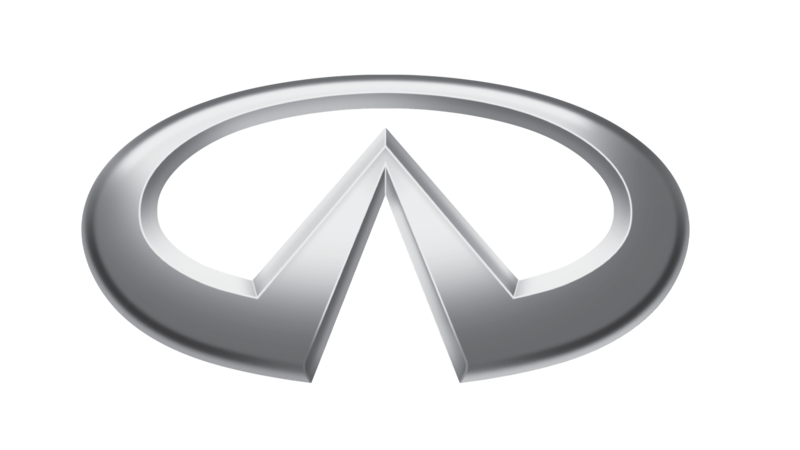 With this in mind, our engineering team set out to create the end-all, be-all of fuel systems for the future. With over 2 years of extensive research and testing, we now have the ultimate fueling solution for your R35 GT-R! Brushed motor fuel pumps create heat due to the brushes rubbing against a commutator. This rubbing wears away both the brushes and the commutator – making the fuel pump a wear item quite similar to your brake pads and rotors. Additional heat is also generated by the pumping and pressurizing of fuel. Since brushed fuel pump output is usually static based off input voltage (battery voltage), the pump is running at 100% duty all the time. In any event, you have heat caused by the friction of the rubbing as well as more heat caused by the constant pressurization of fuel. Contrary to this, brushless motors do not suffer from the friction and wear found on a brushed motor, nor do they generate the same level of heat. Not even close. That’s because, nothing touches outside of a few bearings and it uses a controller to determine speed and output. The controller has the ability to lower output when less pressure is needed and increase output when more pressure is needed. The result is a significantly reduced fuel temperature. To ensure the best results, AMS Omega Fuel Pumps use OE quality brushless motors and automotive spec brushless controllers. One of the biggest problems your R35 GT-R has is the overheating of fuel inside your tank. The fuel tank already sits above a heat-soaked GR6 transmission and exhaust. Having 2 or 3 inefficient brushed pumps inside the tank just adds to this problem. 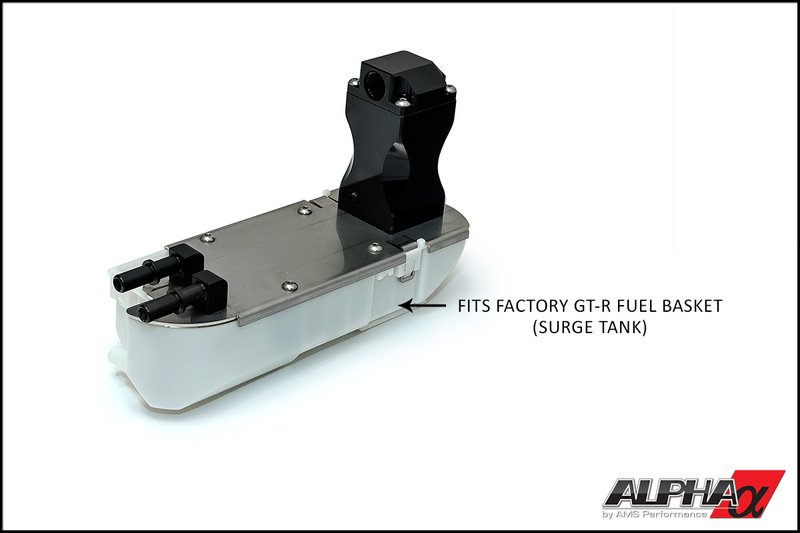 We have seen fuel boil inside a GTR fuel tank with as little as 140° F ( 60° C). When fuel boils, pump output drops dramatically – reducing the fuel supply to the engine. Not enough fuel triggers a lean condition that causes detonation or extreme combustion temperatures hot enough to melt your engine components. In line with the electrical motor, you have the mechanical side of the fuel pump. This is what actually pumps / pressurizes the fuel. 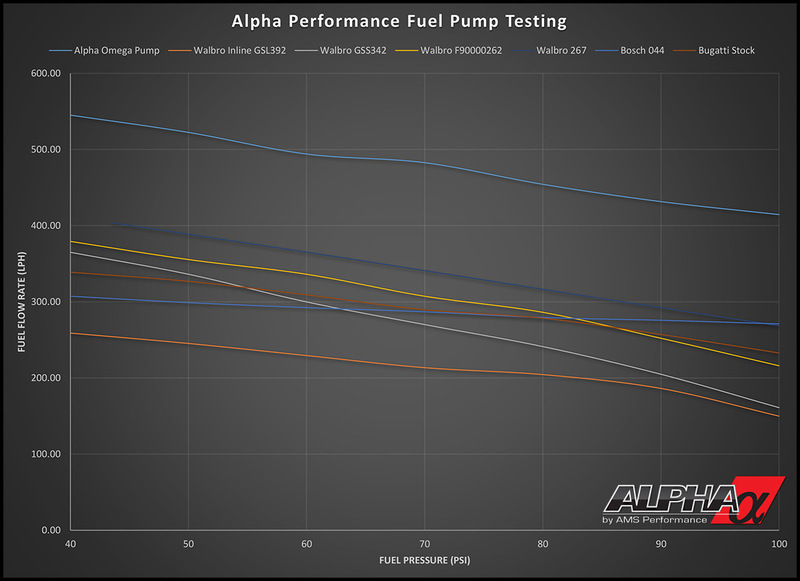 During testing, we found that the style of pump makes a huge difference in pumping efficiency, especially when fuel temperature gets elevated. Traditionally, a vane style or impeller style pump is used. Unfortunately, with this style, fuel output can drop as much as 50% at higher fuel temps. 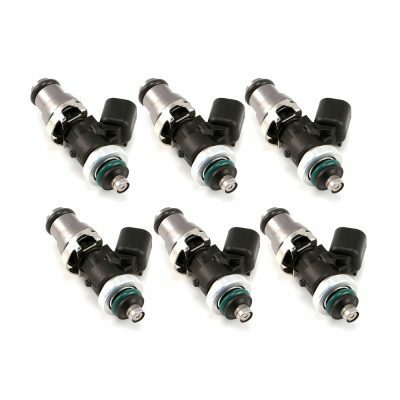 The Omega Brushless Fuel Pump uses a screw style pumping mechanism which is practically immune to this phenomenon. 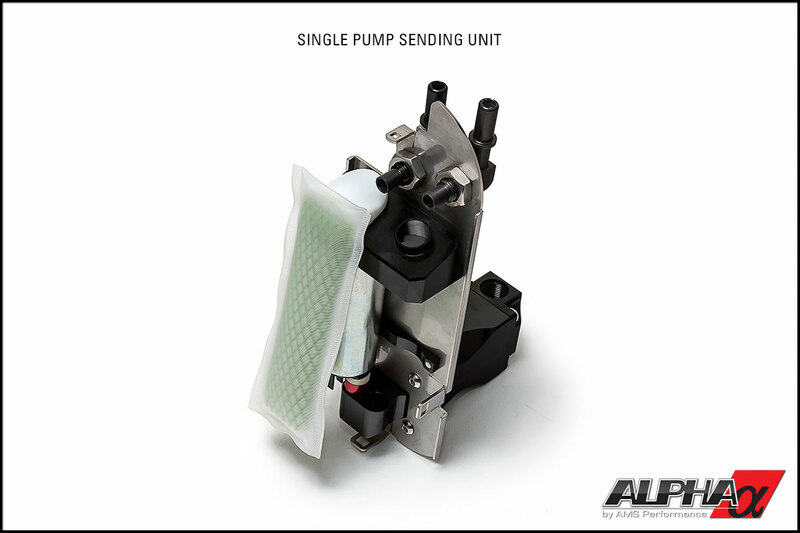 All too often, standard fuel pumps suffer from pressure drop at higher fuel pressures. Our superior screw style fuel pump maintains much higher pressure despite these harsh operating conditions. 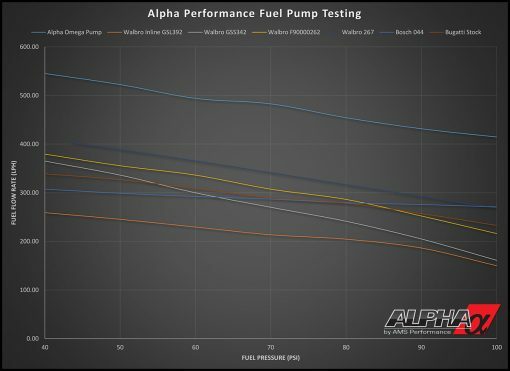 The graph below compares the Omega Brushless Fuel Pump with others on the market along with a stock Bugatti pump for reference. Modified fuel systems are always louder than stock, taking away from your driving pleasure with their irritating whine. With the great horsepower capabilities of the twin turbo VR38 engine, 2-3 aftermarket pumps are often needed which compounds the problem. 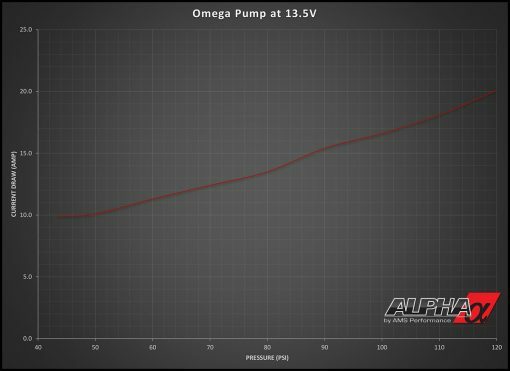 Not only is the Omega Pump quieter than your typical aftermarket pump, just a single pump can supply enough fuel for 1200WHP on regular gasolines (800whp on ethanol based fuels such as E85). Traditional high output fuel pumps are bulky and almost always require multiple pumps to meet fuel requirements. This makes installation inside your fuel tank difficult and sometimes requires dangerous external mounting. The Omega Pump however fits neatly in the stock fuel tank and location – retaining all functionality of the factory fuel system. 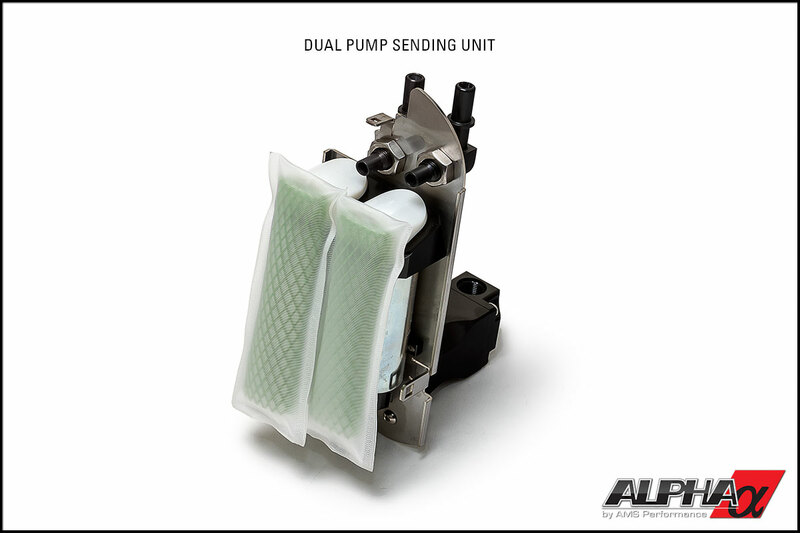 The high capacity allows just one pump to do the work of 2 conventional high performance fuel pumps. In addition, our system comes complete with a precision CNC’d aluminum housing and all the fittings and hardware for a clean installation. Rather than eliminate key functions of the fuel system, we chose to integrate them. The Omega Fuel System actually enhances the factory saddle style fuel system and factory “surge tank” which were designed to help prevent fuel starvation problems during hard cornering and acceleration. Unlike most aftermarket fuel systems, our controller allows you to tailor the fuel output to your specific needs. 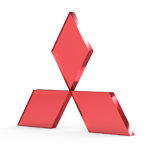 We supply basic settings to help you get up and running quickly. If you choose, it can simply be set up to run like a traditional aftermarket pump. If you need advanced functions, our easy to navigate Graphic User Interface (GUI) makes custom programming of the pump simple. Pump output can easily be controlled one of three ways. Basic: Set up a constant pump output simply by raising pump duty cycle to the desired fuel pressure. Intermediate: Pump output can be staged based off of a switch. Using a Hobbs switch or WOT switch you can switch between two output percentages. Advanced: Pump output can be referenced to a 0 to 5V input. 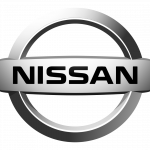 Tapping into a MAP sensor or throttle position sensor will allow the fuel pump to linearly output more fuel as you increase throttle or increase MAP. 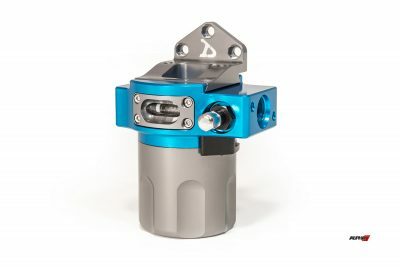 While the initial investment of a low cost pump(s) might be attractive, the overworking of the pump and possible damage to the engine can cost much more, making the Omega Brushless System quite cost effective. 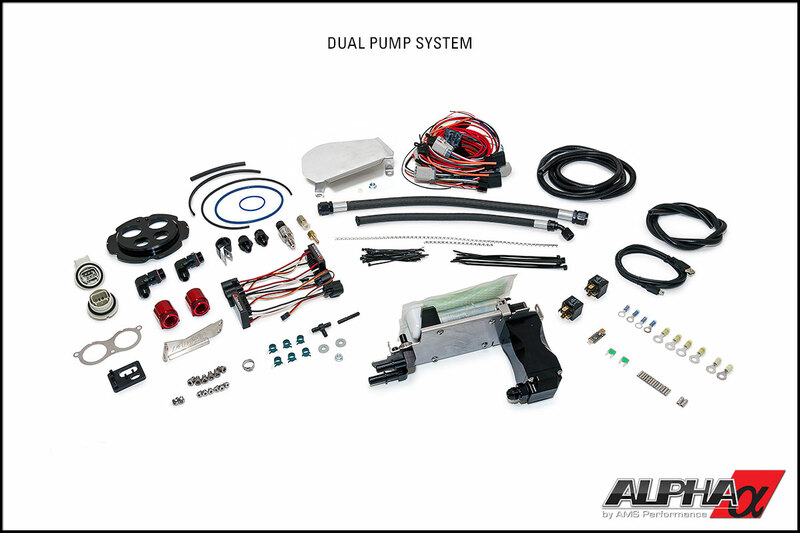 Our system also allows room for growth with one pump able to support 1200whp. If you ever exceed the capabilities of the single pump system an additional Omega Brushless Pump can easily be added to your existing system. 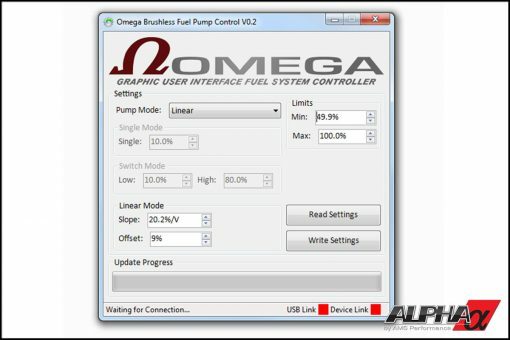 Just like a boost controller, you can dial in the required fuel needed for your specific set-up by simply adjusting the Omega Pump controller for desired flow. 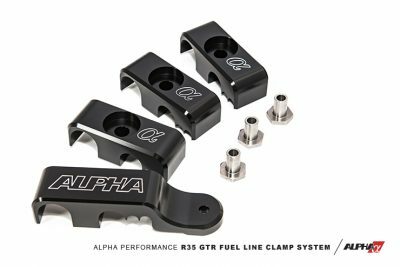 The Omega Fuel System has been thoroughly tested and proven on some of the fastest Alpha powered GT-R’s including our flagship Alpha Omega. For over 2 years we have conducted long term testing on the brushless technology so you can rest assured you are installing the best in your GT-R.
Do it right the first time, order your Omega Brushless Fuel Pump today!